In What We Think, the Verve Team ventures out to try businesses, restaurants, products and trends so you don’t have to! This week we tested out Vermillion’s newest restaurant, Pizza Ranch! 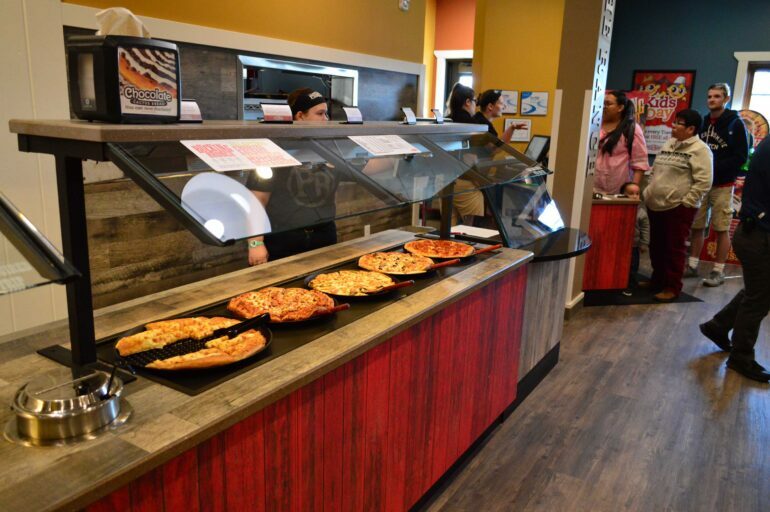 Before Monday, there were eight restaurants in Vermillion where you could buy pizza. Now, a ninth option has been added: Pizza Ranch. You’d think that with eight other pizza options in town would dull the excitement of a new one, but there was so much buzz surrounding the opening, we had to give it a try. Of course, if you’re from the Midwest, like the members of the Verve Team are, you’ve probably already had Pizza Ranch at least once in your life. So, really how different could it be from all the others? We were pleasantly surprised. First of all, the setup of the restaurant was different than other Pizza Ranches in the area. The buffet tables were all in one line and one-sided, while other Pizza Ranches have them scattered and two-sided. We liked the fluidity that the one-sided line offered because we weren’t uncomfortably bumping into other guests or workers. Alright, let’s talk about food. Let’s all be honest with ourselves, no one really ever goes to Pizza Ranch for their pizza. Sure, their pizza isn’t horrible, but if you’re really craving a perfect, delicious pizza, Pizza Ranch isn’t what pops into your mind right away. This is still the case with the Vermillion Pizza Ranch. It was good pizza, just not outstanding. The rest of the food, though? Amazing. The chicken, corn, mashed potatoes and potato wedges were absolutely delicious. We also collectively decided we would be willing to fight people for their Cactus Bread. For you all to understand this, I will say that they had chocolate Cactus Bread. Chocolate. None of the Verve Team members had ever seen that before, and it was heavenly. Also, the workers at Vermillion’s Pizza Ranch were very nice. The cashier was super sweet and we had at least two managers (or two people who we assumed were managers) come up to us throughout our meal and ask us how our food was. Of course, maybe that was just because it was opening day and they were doing that for everyone. Regardless, it made us feel special. Lastly, let’s talk about the Fun Zone. We are not joking when we say we had so much fun in there. Mind you, the Verve Team ranges in ages 19-21, but we still had so much fun, so I’m sure any actual child would have fun too. The Fun Zone had a basketball game, a bowling game, claw games and many more. The one that interested us the most, though, was the Jurassic Park dinosaur shooting game. Not to brag or anything, but we won the high score on that bad boy. All in all, the Verve Team is excited to have another pizza option added to Vermillion, even if there are already eight others. Food-wise, Vermillion’s Pizza Ranch was pretty similar to all other Pizza Ranches, but the service and Fun Zone here were amazing. We give the Vermillion Pizza Ranch a 10 out of 10 and we highly recommend paying them a visit.